The BRICS block conceived as a basket of emerging markets to yield financial returns turned out to be far more suited for building something very different – a governance network that reaches out into different parts of the world. The outreach exercises undertaken by BRICS economies in the past five years may have brought the regional partners of the BRICS countries closer to the block’s core members in terms of the understanding of where the world economy is and where it is headed. But apart from bridging the conceptual divides across the Global South another important dimension is the sheer physical distance between BRICS members and their counterparts in the developing world. Indeed, the uniqueness of the BRICS formation is precisely its geography and the tremendous distance that sets the core BRICS members apart. If one takes the distance between the capitals of the respective BRICS countries any other block or grouping pales in comparison to the polarities exhibited by BRICS linkages. Even if only the economies of BRICS from the same continent of Eurasia are taken into account, the distances between the capitals of India, China and Russia already set the extremes that are hard to match in any other grouping. In particular, the distances between Moscow and Beijing as well as New Delhi and Beijing reach 5787 kilometers and 3800 kilometers respectively, while the Lisbon-Warsaw connection (one of the longer ones between EU capitals) spans 2760 kilometers. The inter-continental divides between BRICS countries take the factor of distance to a whole new level: for example the distance between Moscow and Brasilia amounts to 11180 kilometers . At the same time, the other facet of the uniqueness of BRICS is that while they are extremely far from each other, they are at the same time closer than any other block to the outside world. In this respect, every BRICS economy is a leading force in each of the main regions of the developing world – Brazil in South America, South Africa in the African continent, Russia in the CIS region, China in East Asia and India in South Asia. If the average of all the connections between the BRICS core is likely to be far ahead of any other block, the average distance from the any of the BRICS members to other countries is likely to be the lowest of all regional groupings. Accordingly for BRICS the factor of distance is an unprecedented challenge and a unique opportunity. The extremity of the distance between the BRICS economies renders the attainment of high trade intensities difficult as is borne out by the experience of the grouping in the past decade. Indeed, the indications of the gravity model, which sets potential trade as a function of distance and the respective country GDP levels, suggest that the possibility set in terms of intra-BRICS trade may be limited, particularly along the inter-continental axis. Accordingly, the unprecedented challenge calls for an unprecedented response in terms of mutual integration being promoted in novel ways that serve to overcome the distance factor. The way to overcome distance in economic integration is to prioritize those areas of cooperation that are less affected by the distance factor. One key aspect is the development of the services sector, including financial cooperation and e-commerce. The crucial point here is that the services sector is precisely the segment of all BRICS economies that is relatively underdeveloped and harbours the potential to deliver a critical contribution to GDP growth rates. Nowhere among BRICS is this more relevant than in China, where the switch from industrial to services growth is already transforming services and household consumption into the main engines of economic expansion at the expense of industry and investment. Other prescriptions for dealing with distance include the development of innovative sectors and in particular the digital economy, which may be one of the key ways of transcending the gravity of any given location. Another crucial area is investment cooperation, including through the construction of regional and global value-chains. Most importantly, however, economic integration and infrastructure development present the most powerful tools of overcoming distance – lower trade and customs barriers, greater economic weight of the combined formations, improved connectivity across regions and economic blocks serve to attenuate the geographical barriers. As for the unique opportunity that is harboured by the proximity of BRICS to different parts of the developing world it is largely expressed via the regional partnerships formed by core BRICS members, most notably their priority regional trading arrangements such as the Eurasian Economic Union, Mercosur or SADC. It is through the concert of such regional trading arrangements that the BRICS countries perform the role of conduits to each other’s macroregions in different parts of the globe. 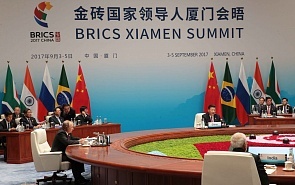 Indeed, this may be the true mission of the BRICS grouping – aside from the creation of alternative integration and development models it is an arrangement that raises the optionality of economic ties in terms of gaining access to different parts of the global economy with BRICS and their regional partners serving as ports of entry or widows into a given macroregion or continent. The key questions are how to leverage this uniqueness of BRICS in terms of their proximity to the outside world and how can the transmission of trade and investment impulses be strengthened across such a framework? Firstly, it appears that boosting regional economic integration between BRICS and their respective regional partners could significantly raise the “conductivity” of linkages from core BRICS members into the wider regions and BRICS-led regional formations. Secondly, a framework of “integration of integrations” that serves as a platform of cooperation among the BRICS-led regional integration groups could significantly raise the capabilities of BRICS members and their regional partners to reach out and establish ties in other macro-regions of the developing world with core BRICS and their neighbours. This interaction between stronger ties across BRICS core members on the one hand and between BRICS and their regional partners on the other may be a mutually reinforcing one: the stronger the regional integration of a given BRICS member, the better the “conductivity” of economic ties from other BRICS countries into that region and the greater the gravity pull of a larger economic weight exerted by the regional integration grouping with respect to other BRICS. And conversely, the stronger the inter-BRICS connectivity, the more attractive is each BRICS core member to their respective regional neighbours as a more reliable gateway into large and expanding markets. In the end, BRICS presents a different configuration compared to any alliance formed thus far – a geometry that shortens the distance with the outside world at the cost of extending the distance among the core members. Another way to look at the geometry of the BRICS alliance is that there is no core and no periphery – in effect BRICS may be termed as being “equidistant” to the outside developing world. Such a setting argues in favour of prioritizing BRICS cooperation towards investment, services and regional cooperation via “integration of integrations”. What it also suggests is that the extended BRICS+ format that brings together core BRICS members and their regional partners could benefit from a flexible “network-type” of an arrangement rather than being predicated on rigid and uniform standards. In terms of geography another block that is unique, but in a reverse fashion is the Eurasian Economic Union. It may be characterized as having the greatest distance to the outside world given the inwardness of the geographical location of most of its members – 4 out of 5 member countries of the Union are landlocked, with most of the Central Asian economies exhibiting extreme distances from the coastal lines.